As we saw in the post on Julian's video, we can gather a great deal of information from patterns of correlation. Above is a measure of rolling correlations among major U.S. stock sectors that I track daily. 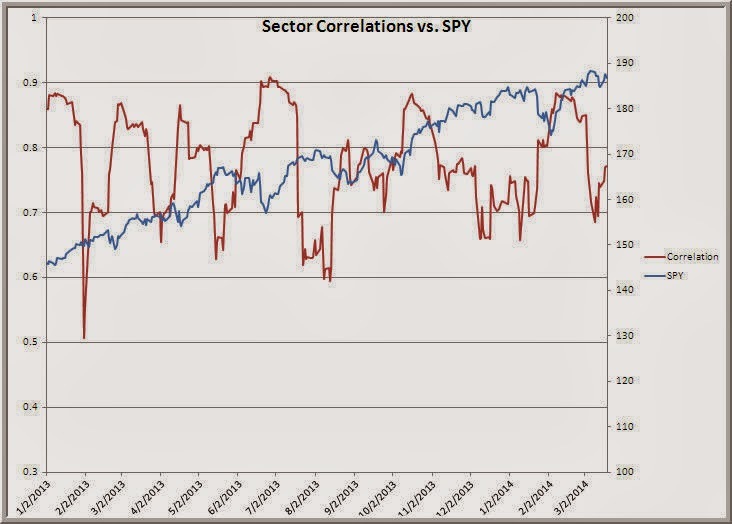 Basically it's a moving average of a composite of the correlations of each sector with every other sector. Correlation has been percolating higher of late, but is not yet at levels that have been associated with recent market bottoms and snap-backs. Since 2013, I notice that the average five-day return in SPY has been about .25%. When the correlation among sectors has been above .80, the average five-day return has been .49%. When the composite correlation has been below .80, the average five-day return has been .06%. When stocks peak, they tend to move their own ways as sector rotation sets in and strong shares stay high while weak ones begin their declines. When stocks fall, they tend to fall in unison--and then often bounce back in unison. It's not just about how stock indexes move; it's also about how stocks move relative to one another.